A san san Joseki: Black gets secure territory in the corner, and White gets outside (center) influence. The result is deemed equal, thus the sequence is a Joseki. 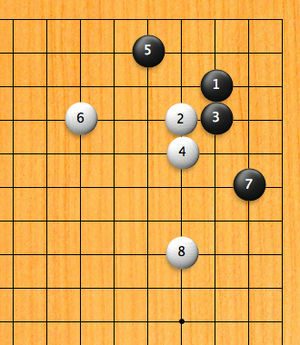 In Go, joseki (定石 jōseki) are studied sequences of moves in the corner areas of the Go board, for which the result is considered balanced for both black and white sides. Because games typically start with plays in the corners, players often try to use their understanding of joseki to gain local advantages in the corners - advantages which can result in a better overall position. Though less common, there are also joseki for the middle game. In Japanese, 定 (jō) means "fixed" or "set" and 石 (seki) means stones, giving the literal meaning "set stones", as in "set pattern". In Chinese, the term for joseki is 定式, dìngshì. The concept of "balance", here, often refers to an equitable trade-off between securing territory in the corner versus making good thickness toward the sides and the center. In application, these concepts are very dynamic, and, often, deviations from joseki depend upon the needs of the situation and the available opportunities. While learning joseki is a tool to defend against a local loss, players always seek to take advantage of weaknesses in the opponent's shapes, often deviating from the joseki. Joseki are not fixed but comprise patterns that have gained acceptance in professional games; they constitute a consensus that may change with certain caveats. Hence, the basic definition may be misleading for new players in that joseki can be misconstrued as foolproof and unalterable and as optimal for all situations. Many joseki are in fact useful only for study within an artificially confined corner, and in real play are only considered good form when used in proper combination with other plays on the board (i.e. other joseki and fuseki moves). Knowing a particular joseki simply means that one knows a sequence of moves, resulting in a balance or fair trade-off between black and white positions. This is in practice much easier than appraising how joseki relate to the rest of the board - hence, knowledge of joseki is regarded as shallow, when compared with the ability to integrate a strategy into a complex game landscape. One go proverb states that "learning joseki loses two stones in strength," which means that the rote learning of sequences is not advantageous; rather, learning from joseki should be a player's goal. Hence, the study of joseki is regarded as a double-edged sword and useful only if learned by understanding the principles behind each move, instead of by rote. Every joseki should be used as a specific tool that leaves the board in a particular shape. A joseki may fall out of use for various reasons, some of which may often seem minor to the amateur player; professionals may consider one variation suboptimal for a very specific reason - one which strong amateurs are not likely to exploit. There is no definitive guide to what is joseki; the situation with joseki dictionaries is similar to that of natural language dictionaries: some entries are obsolete, and the list is likely to be incomplete. Corner joseki conventionally start with one player occupying a corner point, in an empty 19x19 area of the board, and the other player replying with an approach move (Japanese kakari). The initial play in the corner is almost always on a 3-3, 3-4, 3-5, 4-4 or 4-5 point. Other plays that have been experimented with include 5-5, 6-3 and 6-4, all of which sacrifice territory for influence. Of those plays, the classical 3-4 point (komoku) and more contemporary 4-4 point (hoshi) are the most used. The standard approaches are at 5-3 or 5-4 to the 3-4 point, and at 3-6/6-3 to the 4-4 point. The number of subsequent variations is then quite large (of the order of ten reasonable plays for the next one). A Go game opening with two common Joseki in the upper-right and lower-left. Also useful is the tenuki concept of breaking away from a sequence, to play elsewhere, before the 'official' endpoint of the joseki. After a joseki sequence has ended, a play returning to the same area may be termed a follow-up play. There is no formal theory for these, though numerous set sequences can be seen in professional play. It is imperative that players should not play joseki merely from rote memorization but adapt according to the overall board situation. It's important to keep in mind that go is a game involving marginal analysis and joseki are merely heuristics of sound play. Playing joseki blindly will not improve one's game.